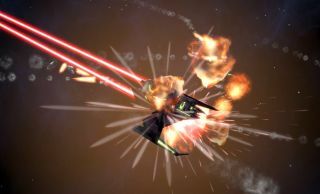 New Galactic Civilizations 3 beta introduces the "Battle Viewer"
"Not only must justice be done," as the saying goes, "it must also be seen to be done." And it's the same with great battles in space: It's all well and good to have your Minister of War tell you that your interstellar conquest is proceeding apace, but sometimes the only way to properly scratch that Space Tyrant itch is to check in on things personally, and then watch them blow up. That's where Galactic Civilization 3's new Battle Viewer comes into play: With it, you may now "see your fleets shoot lasers, launch missiles and blow each other up in glorious detail," from various camera angles, pausing, rewinding, and slowing or speeding the action in whatever way most tickles your fancy. A built-in battle log provides a blow-by-blow breakdown of what's happening on the screen, and developer Stardock says it plans to add even more explosions, weapons and defense effects, and sound effects in the future. The new ideology system, meanwhile, replaces the old system of pyramids and adds a large number of new boosts and unlocks to Benevolent, Malevolent, and Pragmatic leaders, while "extreme planets" promise big advantages to players with the technology to colonize them. The new beta also enables Gigantic and Immense map sizes, and implements the usual array of fixes and balance tweaks. Galactic Civilizations 3 is currently available as an Early Access release on Steam, and is expected to be ready for a full and proper launch sometime this spring.